This horse certainly needs no introduction. Supreme Sultan changed the Saddle Horse industry for the better both in the USA and South Africa. His son's and daughter's today still carry the "Sultan" flame in the show ring and breeding barn. Just think what the Saddlebred genetic pool would have been today without Sultan's Santana, Supreme O' Lee, Radiant Sultan, Sultan's Great Day, Supreme Heir, etc. Supreme Sultan was successfully shown by Tom Moore in harness as a two-year old, winning the Indiana and the Illinois Futurities and the two-year old stakes at The American Royal and the Chicago International. 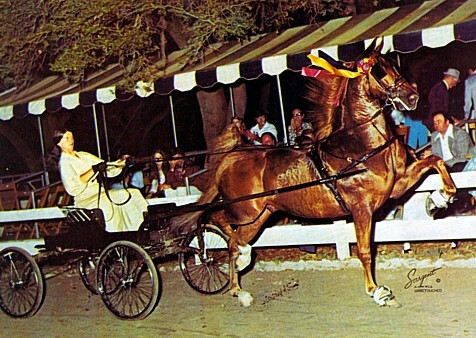 But breeding was why Alvin bought him and at the 1968 Kentucky State Fair the night before the two-year old fine harness stake the stud manager, Bill Caldwell bred Sultan to a mare, Society Dianna. The next day he was third in the class, not one of his best shows but eleven months later Society Dianna gave birth to a colt aptly named Freedom Hall! He later became a Reserve World Champion. This was what was really important to Alvin Ruxer. Later the great Sultan’s Dianna and the legendary Sultan’s Starina were born out of this same cross with Society Dianna. Supreme Sultan’s breeding career success has never been equalled. He has proven that he crossed amazingly well with mares of all types. He also has proven repeatedly that he produced winners in all divisions. 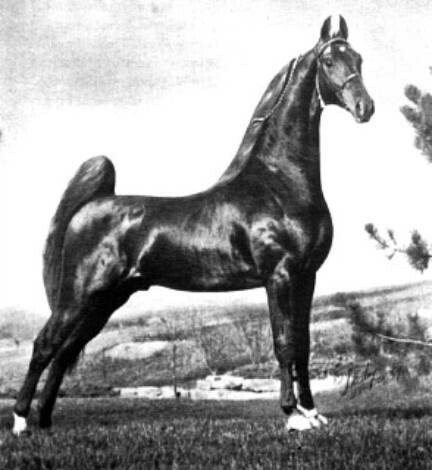 Supreme Sultan’s son, Sultan’s Santana was the first Saddlebred to sell at public auction for over a million dollars. Supreme Sultan died on 6 December 1983 of dreadful colic. He is buried at the Kentucky Horse Park in Lexington, Kentucky. His monument, a beautiful life size bronze sculpture by renowned artist Patricia Crane, lives on in tribute to him. Many people visit this monument yearly. The life size statue of Supreme Sultan on his grave at the Saddle Horse Museum in Lexington, KENTUCKY beautifully sculptured by Patricia Crane. The official unveiling of the life-size statue was on 25 September 1985. 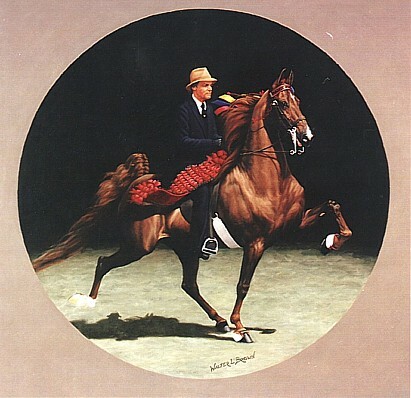 Supreme Sultan was then immortalized as the first introduction to and the first impression of the American Saddlebred at the Kentucky Horse Park for the thousands of visitors going through its gates every year. Questions were asked at the time why Supreme Sultan was chosen to fulfill this role and not the legendary show horse, Wing Commander or the official foundation sire, Gaines Denmark? 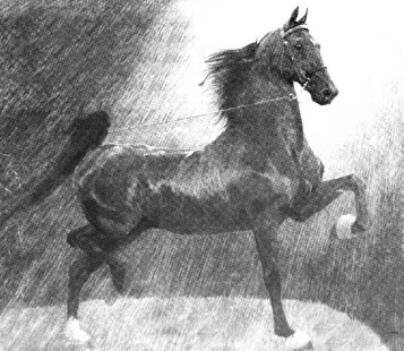 Supreme Sultan was however the right choice because he was the first Saddlebred of the modern era who did the most of reshaping the Saddlebred of the future. The statistics are overwhelming! Supreme Sultan led the "Saddle and Bridle" Sire Rating from 1977 – 1982 and thus tied the record of another great sire, Wing Commander. He accomplished this even though he died young for a breeding horse (17 years old) If he would have lived longer he would have undoubtedly broken the all time record of 8 years, hold by Kalarama Rex. A well known photo by Shirley Paulette. At age 11 years he became the youngest horse ever to top the sire rating. He also led both the futurity and general sire rating and is the only stallion to sire World Grand Champions in all three major performance divisions. 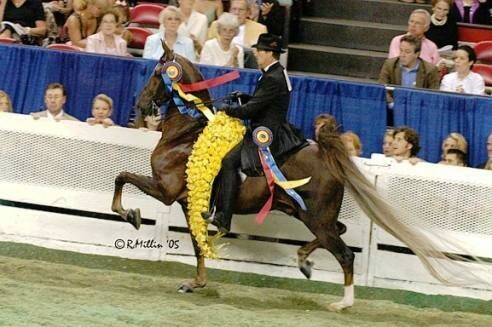 He has off course also sired innumerable winners in every other Saddlebred division as well. He is also the only stallion ever to sire his own immediate successor as leader of the General Sire Rating in 1983, Sultan’s Santana. During the last years of his reign as the “supreme” Sire, his lead over his rivals was awesome! In 1979 he had twice as many points as the second horse, Stonewall’s Main Event and in the year that he died, 1983, he had three times the points of the then leader, his son, Sultan’s Santana. “Had Supreme Sultan not died December 6, 1983 he would have literally blown the lid of Sire Rating records. His accumulation of 44,000 points for the 1982 season has never been surpassed, but his total for 1983 was an incredible 58,990. He sired 84 horses which were show winners in Sire Rated shows last year. 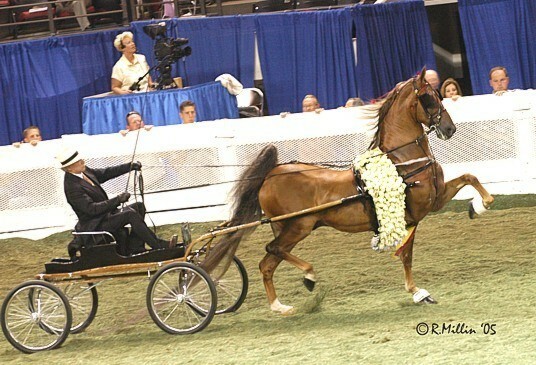 21 five gaited horses earning 21,340, which by itself would have been enough to have topped the ratings. 42 three-gaited horses, 26,870 points – again enough alone to have him number one. 11 in the fine harness division for 4,510 points and 10 pleasure horses earning 6,090. 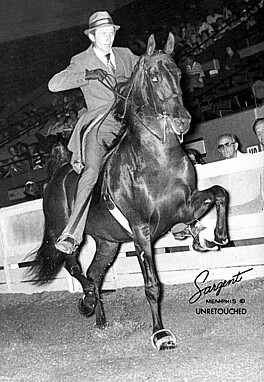 It is only poetic justice that his famous son, Sultan’s Santana, immediately succeeded his great sire as America’s top breeding American Saddlebred stallion. Part of the Sultan’s success story was that as a breeding stallion he started at a very young age and Alvin Ruxer did not waste any time on inferior mares. Promotion was the next important factor. Alvin Ruxer realised the positive role of promotion, this initially meant heavy emphasis on the family ties during Sultan’s first few years as stud. By 1972 at the age of six, Sultan had passed Hide-Away’s Firefly Supreme to take over the number one spot on the Saddle & Bridle’s futurity sire rating. 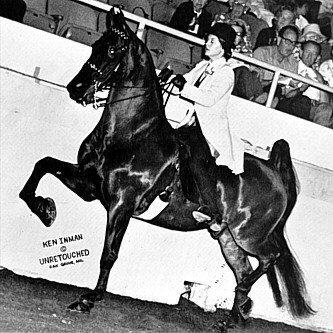 By 1973, Sultan had a performance World’s Champion to his credit – Sultan’s Santana. He won the 1973 three year old Fine Harness division. Like The Sultan, Rare Talent, Freedom Hall, In My Fashion, Sultan’s Supremacy, Sultan’s Wild Cherry, Barbado’s Exit, Good Measure, The Odalisque, Sultan Commander, Freedom Song and That Special Flavour. Supreme Attraction, Candle Dance, The Irish Flame, Man Alive, King of Siam and Sultan’s Dianna. The legendary Imperator was Sultan’s first World Grand Champion during this era as well. Part of his success could be attributed to his early start but also to the fact that Sultan was bred to more than 200 mares per year. This was possible due to the fact that Ruxer Farms was one of the first Saddlebred establishments to exclusively go the artificial insemination route. His conception rate under the watchful eye of the breeding manager, Bill Caldwell was 80 – 90 %! If you have the luck to have seen a video clip that was made at Ruxer Farms about the time Patricia Crane took the measurements for the life-size bronze to stand at Ruxer farms, (and later to become the monument as the frontispiece at the Saddle Horse Museum) you will see some of the above-described elements. I am honoured to treasure such a video clip. Were the offspring not too fine and dainty? No, especially when they were crossed with the more old-fashioned robust Wing Commander mares, definitely not. The son’s and daughters were athletic, beautiful, had high intelligence and extremely good dispositions. They were trainable and soon became favorites with trainers all over the globe. The new slogan for the modern Saddlebred “ Performance never looked so good” was being firmly established by Supreme Sultan’s offspring! People have dubbed the Sultan- Wing Commander cross as the golden cross. Supreme Sultan as sire however was so prepotent and versatile that to prove his superiority with one line or the other is a really futile exercise. 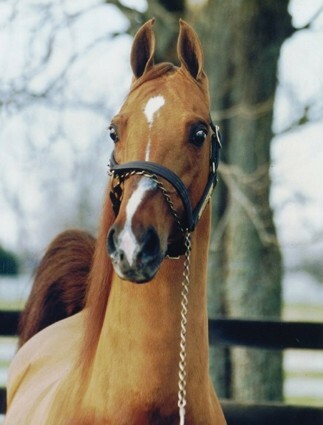 At the 2004 World Champion Horse Show held in Louisville, Supreme Sultan’s offspring triumphed in all three World Grand Championship Divisions on Saturday night. 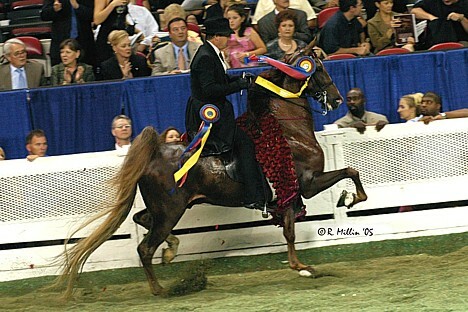 The 2004 Three Gaited World's Grand Champion , An Heir About Her, is a grandchild of Supreme Sultan through her sire Supreme Heir. 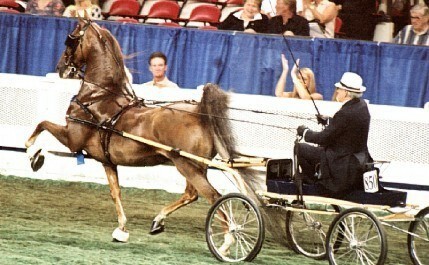 The 2004 Fine Harness World's Grand Champion, Callaway's Copyright, is a grandchild of Supreme Sultan through his sire Supreme Heir. 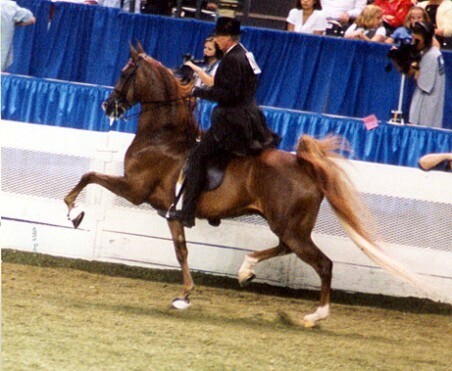 The 2004 Five Gaited World's Grand Champion , Boucheron, is a greatgrandchild of Supreme Sultan through his sire Shamrock Santana. In 2005, Supreme Sultan offspring once again triumphed in all the World Grand Championships. 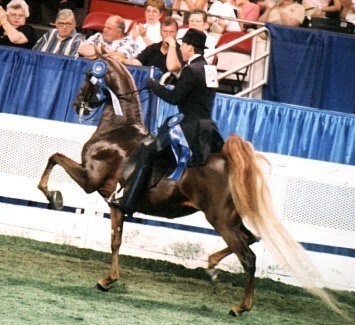 Manila Thrilla, trained by Todd Miles was the 2005 Three Gaited World Grand Champion. He is a line bred Supreme Sultan being by Sultan’s Royalty (Supreme Sultan x Starlike) out of the mare Sable Rose who is by Talent Town out of the Supreme Sultan mare Sultan’s Lou Lou. 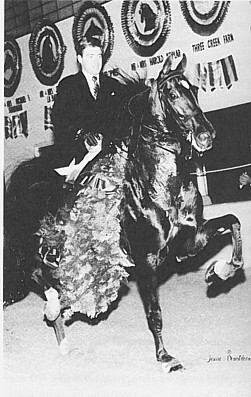 Five O’ Clock and Todd Miles was the 2005 Five Gaited World Grand Champion. 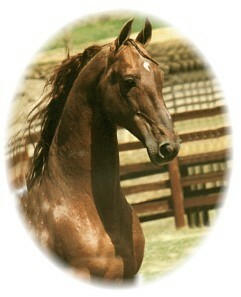 His sire, Select Stock, is out of a Supreme Sultan mare, The Diva. Five O’ Clock’s dam, Long Island Ice Tea, is a linebred Supreme Sultan due to the double influence of Manhatten Supreme who is by New Yorker out of the Supreme Sultan daughter, Sultan’s Keepsake. 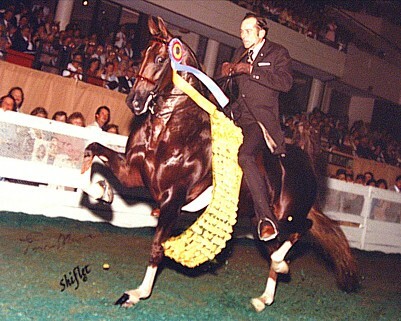 Supreme Sultan more that any other stallion helped set the standards for a new era in Saddlebred history. Both in the way he sired horses and in the way his career was managed and promoted. 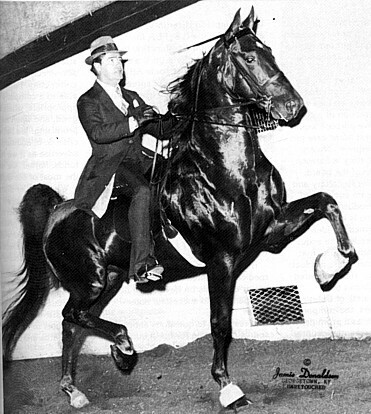 When one thinks of the ideal Saddlebred you HAVE to make reference to Supreme Sultan. 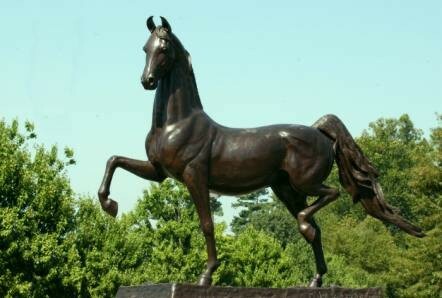 The beautiful Supreme Sultan monument sculptured by Patricia Crane at the entrance to the American Saddlebred Museum, Lexington, Kentucky. 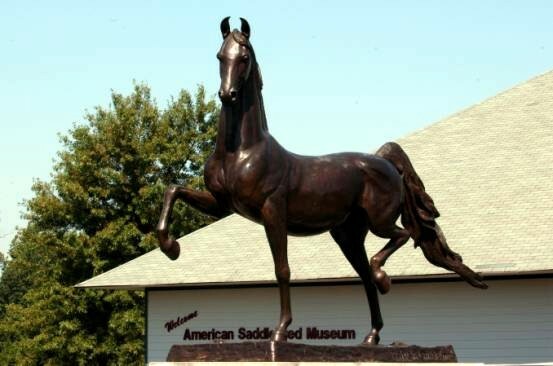 The mantle of immortality that the monument at the front of the Saddle Horse Museum in Lexington by Patricia Crane and bestowed on him by the ASHA is fully well deserved. Now that Alvin Ruxer also has passed on, this is a fitting monument for him and the major contribution he and his wife Hilda made to the Global Saddle Horse World as well. Supreme Sultan's sons and daughter and their descendants have and will continue to produce show stars for years and decades to come, and will go on making their own contributions as perpetuators of the breed. Their legacy is the wonderful colts and fillies that parades across the globe today as the IDEAL MODERN American Saddlebred! Patricia Crane for use of her beautiful pastels (used in th S.A. Show Horse article) and anecdotes of the life of Supreme Sultan and Alvin Ruxer. American Saddle Horse Museum, especially Tolley Graves and the other staff who let me use the Museum library. Bob Ruxer of Ruxer Farms for supplying me with information.